It’s time to get your feet wet & discover sailing! This course will be for those who have no prior sailing experience and wish to find out what sailing is all about. Bring your enthusiasm and be prepared to have fun! You’ll be surprised to see just how affordable sailing can be. OBJECTIVE: In this course you will be introduced to sailboat parts, how to rig a sailboat, the principals of how a sailboat moves through the water using the wind, local navigation, seamanship skills, boat handling under sail and power, reefing, heaving to, anchoring, docking and crew overboard procedures. By the end of this course you will be able to safely sail in familiar waters as crew of a small sailboat in moderate wind and sea conditions by day. Minimum of 2 students required for each course. CERTIFICATION AWARDED: Sail Canada Start Keelboat Sailing Standard. Take the on water course and complete course handouts to obtain certification. 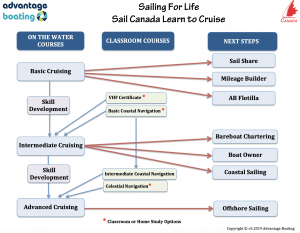 Next Steps once you’ve completed your Start Keelboat Sailing course.